Frequently when we arrive in a registered psychotherapist’s or psychologist’s office, it is because of the chaos of life intruding on our mind, our emotions, or our relationships: we cannot focus, we are buffeted by tsunamis of emotions with few skills on how to surf the waves, a relationship we relied upon for stability has changed, disappeared or betrayed us. However, just as frequently, those who arrive in the therapy office are struggling with the opposite end of the dialectic from chaos: over control. There are occasions where the one arriving in the therapy office with the suffering caused by polarity of over control has waited much longer, has experienced years of suffering that has not been recognized by others, and feels profoundly ashamed, lonely, or bitter at few fruits from their years of conscientious devotion, discipline, or self sacrifice. We know that the pain and suffering at all points of the continuum between the polarities of chaos and over control are real human pain and suffering. However the strategies for addressing the suffering may be somewhat different. This post is about strategies for addressing the pain and suffering of those caught in the grips of over control in mind, heart, and relationships with others. Recently Dr. Sogge attended a professional training session with the founder of the Dialectic Behavior Therapies Center of Houston, Texas, Dr. Karyn Hall. Dr. Hall is a leader in the application of a new Third Wave evidence based approach to over control named Radically Open DBT (RO-DBT). What Dr. Hall pointed out as she presented to a group of psychologists dedicated to the integration of psychology into health care, was that a significant proportion of people fail to benefit from mental health treatment, due to chronicity, co-morbidity or pre-existing personality problems. Due to the pervasive WEIRD world model of much of psychological research (much intervention research is conducted in controlled environments with many exclusionary criteria, primarily on White, Educated, Industrialized, Rich, Democratic populations), existing treatments are often not effective for very difficult problems such as chronic depression, and anorexia nervosa. In the case of depression, treatments consistently help 1/3 of individuals, with another 1/3 improving but remaining symptomatic, and the last 1/3 not improving (Hall, 2019 citing Berlim & Turecki, 2007; Rush et al., 2006; Souery et al., 1999; Thase et al., 2007). The WEIRD world of psychological research is in high contrast to the lived experience of most people entering the offices of psychotherapists and psychologists; most people who seek mental health treatment present with complicated lives, multiple conflicting problems, and issues that have sometimes been decades in development. (Hall citing Friborg et al., 2014; Kessler et al., 1994; Swimbourne et al., 2012; Martinussen et al., 2016). What to do? Enter new ways of thinking about and conceptualizing mental health and treatment. The National Institutes of Mental Health have begun to focus funding on trans-theoretical models of mental health disorders, and trans-diagnostic strategies for treatment. In the new NIMH models, there is an emphasis on psychological theory and research that integrate biological science with behavioural science; there is also an emphasis on new ways of classifying psychopathology that go beyond the categorical approaches traditionally developed in psychiatry. In addition, the NIMH now values Trans-diagnostic Treatments; that is, treatment approaches that account for shared genotypic and phenotypic features rather than focusing on diagnoses. This is where Radically Open Dialectical Behavior Therapy (RO-DBT) comes in. Radically Open Dialectical Behavior Therapy (RO-DBT) is a trans-diagnostic treatment that aims to treat maladaptive over-control. RO DBT is informed by 20+ years of translational treatment development research. 350+ patients have received RO-DBT in research trials throughout the world—plus, thousands of individuals have participated in the treatment clinically (Hall, 2019 at NAPPP San Antonio). RO DBT is informed by: Dialectical philosophy Behaviour therapy (developed by University of Washington professor Dr. Marsha Linehan), mindfulness-based interventions, and interpersonal contemplative practices drawn from Malamati sufism. How is RO-DBT part of the Third Wave of Psychology? RO-DBT shares many of the theoretical underpinnings and trans-diagnostic orientation of other contextual behavioural science approaches favoured by the team at Ottawa River Psychology Group: Linehan’s form of Dialectical Behaviour Therapy, Acceptance and Commitment Therapy, Mindfulness Based Interventions, and Compassion Focused Therapy. RO DBT is trans-diagnostic in the sense that rather than focusing on eliminating symptoms associated with a diagnosis such as the Anxiety, Depression, Obsessive Compulsive Personality Disorder or the Autism Spectrum Disorders, RO-DBT posits that social-signalling deficits stemming from maladaptive over-control are the core mechanism maintaining many of these disordered symptoms, based on evidence showing that OC coping preceded the development of psychopathology (Hall, 2019). RO-DBT also shares with other Third Wave Psychology approaches an emphasis on evolutionary psychology; as the founder of Compassion Focused Therapy, Dr. Paul Gilbert, frequently states “our minds are not are fault; they are our responsibility”. That is, many of our habits of mind are formed by the forces of nature, which required us for our own survival to find a way to ‘bind genetically diverse individuals together’ in such a way that ‘survival of the tribe’ could override older ‘selfish’ tendencies linked to survival of the individual (Hall, 2019). In the case of RO-DBT as a treatment for disorders of over-control, there is an emphasis on social bonds and self-control, and restoring equilibrium to these influences on the mind. Frequently, the suffering of those with disorders of over control may stem from an excess of self control. Self-control is “the ability to inhibit emotional urges, impulses, and behaviors in order to pursue long-term goals” (Hall, 2019). Self-control capacities enable a person to not immediately consume valuable resources and instead save for times of difficulty, assists an individual to refrain from acting on every impulse, allowes us to work together in groups without the fear of being immediately attacked if we make a mistake or inadvertently annoy someone. This all sounds very positive and prosocial, right? What is the problem? 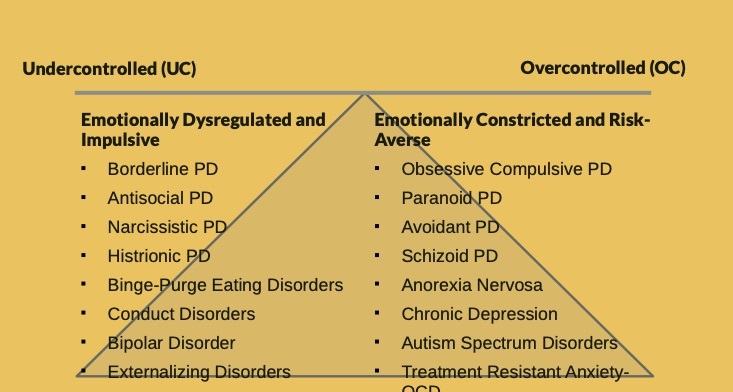 Part of the problem is the disorders of over-control are often not recognized; the price of prosocial behavior may come at an enormous cost to an individual in terms of flexiblity of cognition, feelings of safeness, interpersonal connectedness, and sense of being valued and appreciated, but these costs often have social benefit to the larger community, so others may not recognize the signals of the person who is suffering when their contributions and habits of mind are costing them too much. We can all recognize when someone is struggling with lack of control: they are the person yelling and gesticulating with road rage, the couple having a public fight in the restaurant, the guy who takes a swing at the bouncer in the bar. We are not so effective at recognizing when someone is struggling with over-control: overcontrolled people are not taking part in riots, they are more likely to be the ones organizing the crowd control strategy; they are hyper-detail-focused perfectionists who tend to see ‘mistakes’ everywhere (including in themselves); they tend to work harder than most to prevent future problems without asking for a lot of credit; even more difficult, they may be expert at not appearing different on the outside (in public) (Hall, 2019). Whereas under-control is linked to substance abuse, criminal activities, domestic violence, financial difficulties, teen pregnancy, smoking, obesity and other difficulties; over-control is pro-social and often valued. Do the following characteristics sound pro-social? Desires to be correct, exceeding expectations and performing well. These are essential for community success. These are needed in order to resist powerful yet unethical individuals or harmful societal pressures. This thriftiness saves valuable resources for less abundant times. These traits help societies to flourish and ensure that those in need are given care. In the past, research tended to think of self control as linear, assuming more was always better. Do you remember the Stanford Marshmallow Experiment? Self control was posited to be the predictor of a myriad of outcomes later in life, from health, to wealth to relationship success. More recent research suggests that self control is not linear, in other words: you can have too much of a good thing. 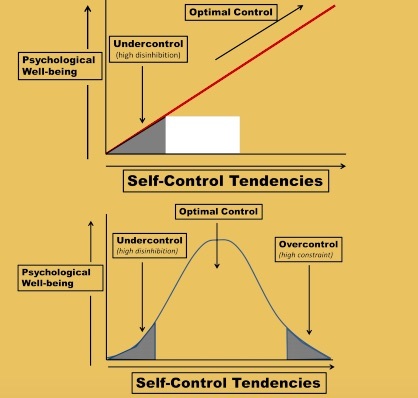 Figure I demonstrates the bell curve shape of Self Control tendencies posited by RO-DBT. Figure II demonstrates where common mental health diagnoses may fall on this bell curve. How exactly does this work? Why is it that self-control would lead to such suffering? RO-DBT does not blame sufferers of over-control, rather it validates their suffering as the pain of social disconnection, or loneliness secondary to Low Openness & Social-Signalling Deficits; this is loneliness that is not necessarily due to a lack of social contact but rather due to a lack of social connectedness. This is how a leader of an organization that prides itself on teamwork, can be found dead in their office by their own hand; or why a person dedicated to becoming the perfect specimen of a fit and toned body, adored by thousands on social media, can feel that they have few friends to confide in when they are in trouble. There is so much more to be said and written about the suffering of over-control, but the good news is that with Radically Open DBT and other evidence based interventions, individuals suffering from the loneliness and social disconnection of over control can bridge the gap with cognitive, emotional and interpersonal skills training, social safeness, and models of flexibility in the context of a therapeutic professional relationship. If you would like to talk to someone about over-control difficulties contact Ottawa River Psychology Group here or call as at 613-656-3331. Dr. Sogge will be offering a Third Wave Grand Rounds online for health professionals on April 14, 2019 titled The Radically Open Heart: Healing the Suffering of Over-control. Check back here for access to the teaching video of the presentation. May your mind be flexible. May your hands both work and play. May your relationships feel safe. By Kimberly Sogge on February 4, 2019.